You can build a Bear Mountain Canoe! Deceptively beautiful, the Bear Mountain Canoe is not only rugged and functional, but is easily built by anyone with a minimum of carpentry tools and wood working skills. 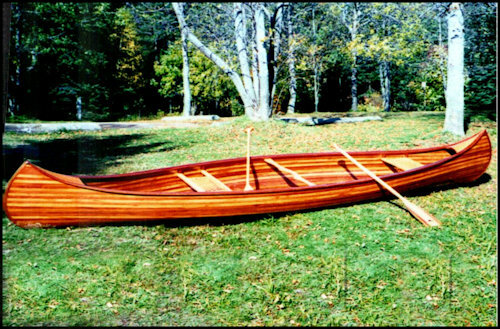 The Bear Mountain Style of canoe building was developed by Ted Moores, internationally recognized canoe builder, designer, author and teacher. When you build a Bear Mountain Canoe, his 17 years of experimenting, designing, and building luxury canoes are at your side. Your first canoe will exceed your wildest dreams. The wood/epoxy strip plank system is a series of simple, easy to do steps. When we show you the right order, you can experience the magic of being part of your canoe and all it knows. It is as simple as edge glueing narrow cedar strips over a temporary mold and fiberglassing inside and out with Epoxy Plus epoxy resin. After sanding and varnishing, the fiberglass cloth becomes transparent, giving the appearance of natural wood with many coats of varnish.